The Florentine Opera Center serves as the heart of Milwaukee’s Riverwest neighborhood providing theatrical and operatic programming as well as opportunities for youth education and community outreach. The Wayne & Kelly Lueders Florentine Opera Center was founded in 2011 in Milwaukee Wisconsin’s RIverwest neighbor as part of a project to revitalize the neighborhood. The opera house serves as the center of production for the Florentine Opera Studio Artists with two performance spaces, a warehouse for storage of production equipment and stage pieces, and work spaces for building custom sets, costumes, wigs and more. The 3,000-square foot building also has full kitchen facilities and office spaces. The Florentine Opera Center is supported by donations from citizens in the community and the Northwestern Mutual Foundation, a memorial trust, Wayne and Kristine Leuders and Cathy Costantini. The Florentine Opera Company who performs at the center was founded in 1933 as the Italian Opera Chorus, the current name started being used in 1944. The company has had Grammy award winning recordings, and many notable performers from around the world including Luciano Pavarotti. The Florentine Opera Company performs “The Center Series” At the Florentine Opera Center with performances several times throughout the year. These performances are scheduled a year in advance for a calendar season. Brochures are available at the box office and online. Tickets for performances or for the entire season can be purchased in person, or through the box office online or over the phone. The Florentine Opera Company is involved in many ways throughout the Milwaukee community through outreach as well as events that are hosted at the Florentine Opera Center. Details on events are accessible on the calendar on the Florentine Opera website. The Boheme Society- This group requires membership and is a place for likeminded, young professionals with an interest in musical theater and opera or vocal performance, production or the like can network and support each other. The group attends parties, film screenings, concerts, artist receptions, and other gatherings together. Membership to the group includes mentorship by the Florentine Opera Board, training sessions, personal growth and development opportunities in the community, discounts on tickets, and more. Talk Opera- One hour before curtain call on mainstage performances all ticket holders are invited to an indepth discussion on the opera in the Magin Lounge. These lectures are free with ticket purchase. Opera Insights- These community events are hosted at the Wauwatosea Public Library presented by the Florentine Opera Company and give a synopsis of the current opera in performance and the background of the piece with live performances by the Florentine Opera Studio Artists. Florentine Camerata- This LBGTQ-friendly affinity group fosters fellowship within the community and presents a variety of events and performances with a focus on education and generating enthusiasm for the art. This group meets at the Cream City Foundation and is sponsored by the Wisconsin Gazette. The Florentine Opera Company has an Education Department with a mission to make opera not only more inviting to young people, but more accessible to communities in Wisconsin. 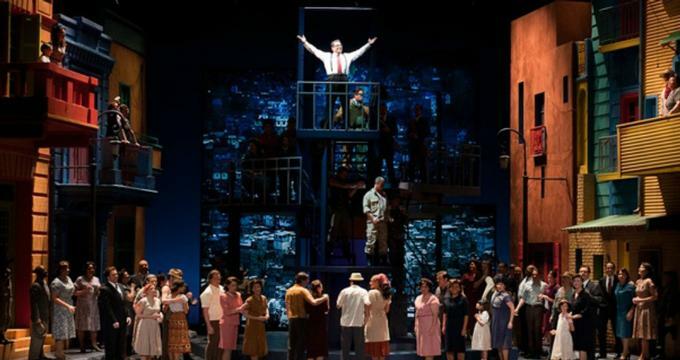 The Florentine Opera Company seeks to use community outreach to education students on careers in opera and within other arts, provide continuing education for adults, and professional development for young artists. Florentine Voice Factory- This special event only happens a few times a year and is a free opportunity for community performers and members of the Florentine Opera Chorus to receive coaching and feedback from the Chorus Master at the Florentine Opera Company. This casual coaching session is two hours long and will participants prepare for auditions, network with colleagues, and watch open coaching sessions. This event is open and free to the public for those who wish to watch coaching sessions. Participants must be at least 18 years old and must reserve their time slot. The Young Singing Actor Intensive- This annual week-long summer camp is for students in grades 9-12 who are pursuing advanced vocal studies. Students must apply for the camp which is comprised of workshops and training from the Florentine Artistic Staff and clinicians who have been invited to teach at the camp. The final evening will feature the campers in solo and ensemble performances in operatic and classical voice. Opera in the Schools- Florentine Opera Company partners with educators to offers resources and programs to bring opera to the schools for grades k-12 through visual, oral, and performance methods. Many of the programs offered through the Education Department can also be used in libraries, community centers and more.